While military theorists had expounded on the concepts of attack and defence in numerous treatises, their theories presented the ideal forms and did not consider the practicality of many of the methods presented. Furthermore, their ideas for building elaborate stone defences failed to take into account the time involved in construction and the costs. As the Civil War was to prove, fortifications built hastily did not always reflect the standard principles of defence. Nonetheless, it is useful to examine the various theories put forth in contemporary manuals, particularly those that might have been available to the belligerents in the war. A typical siege scene of the late-16th century showing the operations of the Spanish against the Dutch city of Grave in 1586. In the centre is a large eight-gun battery firing from behind gabions. Storm poles protrude from the embankment of the battery. Reconstruction of the Queen's Sconce at Newark-on-Trent, Nottinghamshire, as it might have appeared during the Civil War. 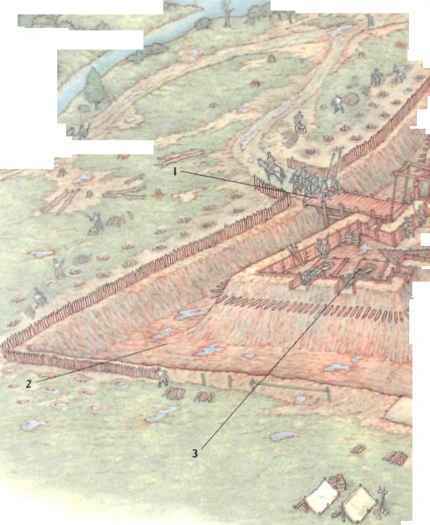 This was a typical bastioned fort of the period designed to create intersecting or flanking lines of fire against any attackers. Built of earth, it could easily absorb shot while its angled design could deflect cannon balls. It probably had a palisade and an earthen parapet as well as storm poles for added protection. Such forts may have contained wooden buildings to store ammunition and provide storage. 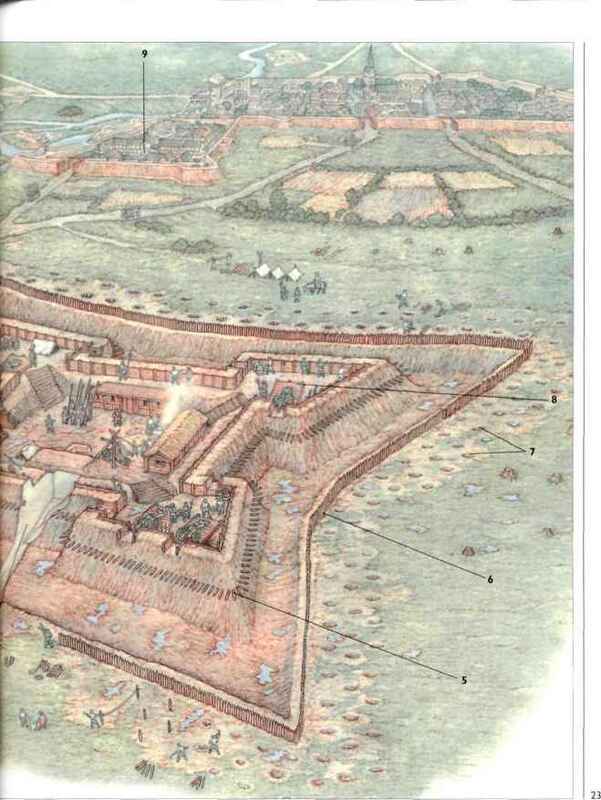 A perspective view of the siege operations in 1650 before the fortress of Longone. Italy. Many Civil War scenes would have resembled this although not quite on the same scale. Various fortified camps and entrenchments built by the besieging forces can be seen. How to Fortifie a long Curtain with Bulwarks, or a straight Town Wall', from an engraving published in the Mariner's Magazine.This was the standard form adopted by many towns possessing walls, employing the Dutch method of flanking walls perpendicular to the curtain. almost unlimited resistance against artillery fire, whilst being as difficult to climb as masonry walls when suitably reinforced with palisades. One other departure from the Italian system was that the Dutch always built the flanks of the bastions perpendicular to the curtain, whilst the salient angle of the bastion itself never exceeded 90°. The line of defence from one bastion to another was never longer than 240 yards if it was designed for musket defence, but could be longer if it was defended by cannon. These concepts were fully embraced by domestic military writers, and several laid the theoretical groundwork for artillery fortification by providing plans and outlines detailing the relevant principles and the variety of structures. There was a growing interest in the science of warfare and it has been estimated that around 60 volumes detailing the ideal conduct of war were published in English between 1600 and 1625, while an additional 33 appeared in the seven years prior to the outbreak of war in England in 1642. Some were direct translations of continental works while others were based on direct observation. Among the latter was Henry Hexham's Principles of the Art MUitarie Practiced in the Warres of the United Netherlands published in 1637 and re-issued in 1642, and Robert Ward's Animadversions of Wane, which appeared in ¡639. Hexham (c. )S85-)65t)> had been in the service of Sir Francis Vere from 1601 to 1606, and had risen to quartermaster with Vere and later with the Royalist commander George Goring. He had seen action in various battles including the operations at Nieuport in Flanders. above The irregular Fort Royal with five bastions built by the Royalists at Bristol, from an engraving in the Mariner's Magazine. It is doubtful whether the majority of fortifications built during the Civil War were as precise as this. above Title page of Animadversions of Warre by Robert Ward. Manuals such as this provided the basic principles for attack and defence in 17th-century England and were often based on studies published on the Continent. Other works that borrowed heavily from these earlier tomes appeared during the war anil quoted examples from the conflict to illustrate arguments. Such examples were A Practical! 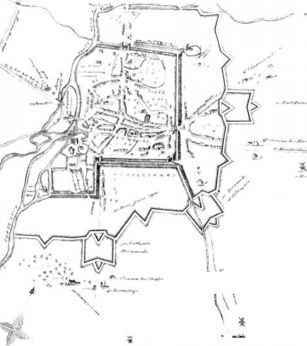 Abstract of the Arts of Fortification ami Assailing by David Papillon published in London in 1645/6, Ball's Propositions of Fortifications of 1642 and Nicholas Stone's Enchiridon of Fortification of 1645. The title page of Stone's work nota) the following details about the work. It would demonstrate 'both by Rule, and Figure, (as well Mathematically by exact Calculations, as Practically) |how| to fortify any Body, either Regular, or Irregular. How to runner Approaches, to pierce through a Counterscarpe, to make galleries over a Mote, to spring a myne, &c'. 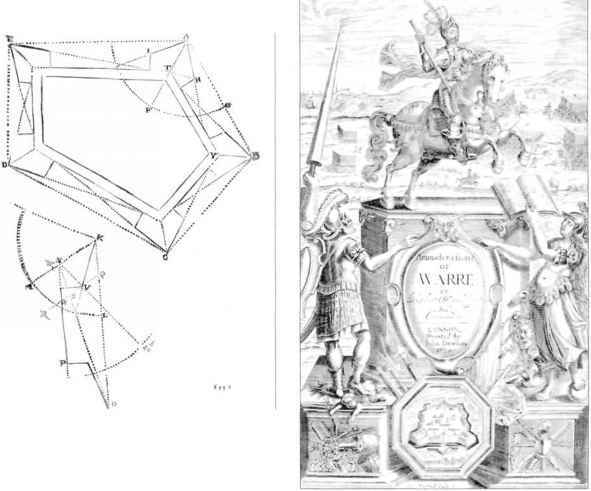 Mathematical principles permeated all such fortification studies, setting down the correct angles anil length of walls, and the optimum area for each kind of structure. Whether such works were in wide circulation during the war cannot be determined but an interesting bookseller's account for books supplied to Colonel Edward Harley in Cambridge up to 14 March 1641/2 includes Hexham's volume and John Cruso's camp-building manual, Castramentation, Or, Tltc Measuring out of the Quarters for the Encamping of an Army. Some fortifications may have been built from memories of continental forms. One cannot underestimate, however, the knowledge and awareness of artillery fortification among the educated classes in England of the 1640s and the fact that many places constructed defences bearing some resemblance to continental principles suggests more than just mere guesswork. 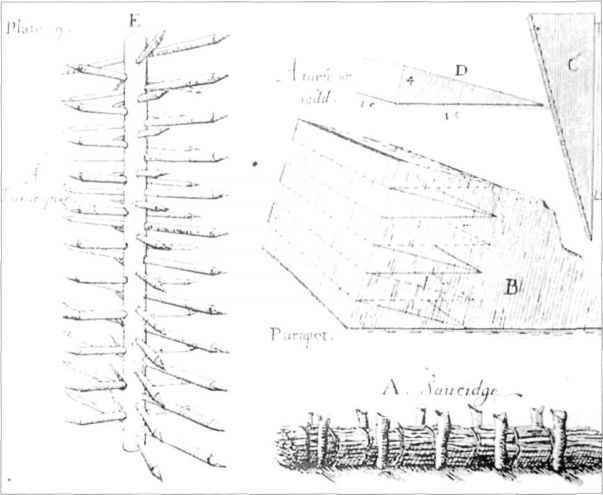 A plate from Enchiridon of Forlificalion by Nicholas Stone published in 1645 illustrating a design for a vertical turnpike and the method for stacking turves to form a rampart; a 'saucidge' was a bundle of wood bound together and used as a protection for entrenched soldiers.